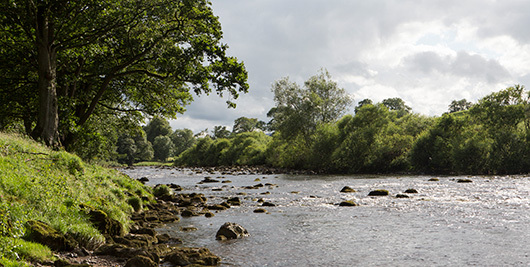 Club members may fish the right bank of Bishopdale Beck from the road bridge grid SE 026 889, (called Hestholme bridge on the 1:25000 OS map) to its confluence with the River Ure, and the south bank of the River Ure from the beck mouth as far as Low Holm Wood (grid SE 053 902), best identified on the ground by the confluence of the flood channel behind the large wooded island opposite Mill Farm with the main channel of the Ure. Please note that the lower limit for grayling fishing is Spence Dub, grid SE 035 899. Four rods are pemitted at any one time. Anglers should fish through all pools and runs and should not monopolise any part of the beat if others are following. During the trout fishing season, for the upper part of the beat, parking is permitted at Adams Bottom Farm grid SE 028 892. At Adams Bottom Farm, parking is on the hard standing to the right of the black corrugated iron buildings and NOT near the house. To get to the river near Bishopdale Beck members should then walk away from the house along the track as far as the first gate/stile. Once through the gate, turn immediately left along the line of the wall and up the bank. At the top of the bank, and in the corner of the field there is a new gate and path that leads down to the river and the beck. Please do not walk in front of the house. For the lower part of the beat, i.e. downstream of the stepping stones and Redmire Falls - parking is at approximate grid reference SE 047 890, which should place you on firm ground near a gate above a steep track leading down to the wooded island. Please refer to the maps supplied in the membership pack, or check in the forums if you are unsure. The access to the lower part of the beat is via the aptly named 'Back Lane', which is clearly identified on the detailed maps. This is a walled road which has a good concrete surface, but it is exceedingly narrow - the lane can be reached by driving round the west side of Berry's Farm Shop. The entrance to Back Lane can be found adjacent to the eastern end of the overflow car park immediately behind the shop. Ignore the first exit on the left, members should turn off the road at the exit on the left hand side approximately 100 yards before the end of the lane, after which they should drive across the fields on the track shown on the detailed map included in the membership pack. If you reach the end of the lane, you have gone too far and should turn back. Be aware that there is a deep ditch on the eastern side of the last couple of hundred yards of the lane which lies in close proximity to the concreted surface. Parking for this beat is also possible at the AA box. Please note that after September 30th, access to the river is by Adams Bottom Farm only. Fishing on this stretch is for brown trout and grayling only, the salmon fishery being let to another syndicate. The nature of the water means that the fish tend to be small and very wary, but it is essentially a wild fishery and the scenery is exceptional. The Swinithwaite Hall water is unsuitable for physically handicapped anglers. Note should be taken that breeding herds are kept on the estate and members must ensure that all possible precautions are taken not to disturb or endanger stock. When driving on the Swinithwaite estate ground in particular, members should be careful to proceed slowly and with every possible caution. Please note that the syndicate has rights only to the right (south) bank of the River Ure. The riparian owners of the opposite bank may permit fishing by persons other than members of the syndicate, and have the right, subject to any by-law or regulation, to determine the method and season of fishing from that bank. Members who fancy a spot of lunch should check out Berry's Farm Shop near Swinithwaite Hall, which serves extremely good food. Two estate rods are reserved. All persons entitled to fish these rods will carry a membership card endorsed 'estate rod'. Members are requested to extend every courtesy to riparian owners and their guests.